From time to time we are able to offer ex-demo and used equipment for sale. These items were all supplied by us originally and have either been used for demo purposes only, or we have been asked to re-sell them on behalf of the original owners. We also have a few items of production equipment left over from our old studio that needs to find a good home too, so look out for non-floatcam stuff here too from time to time! All kit can be viewed and tested at our Pinewood Studios office. Originally supplied by us and offered by the owner in ‘as new’ condition. Comes with all standard accessories, a MOY fitting and an HD MoCo system (legs shown not included). A great opportunity to pick up a well maintained HD for much less than list price! 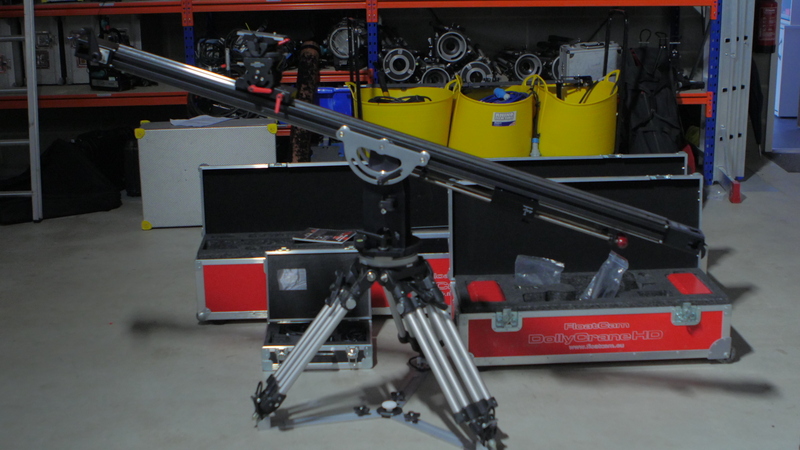 On behalf of a customer, we are offering a pre-owned DollyCrane SD kit complete with Manfrotto 528XB heavy duty tripod and Manfrotto MN502AH fluid head. The kit has had very little use (hence the sale) and will be checked by us prior to shipping. Body only (no lens). Very good (near mint) condition, 1 yr old. Supplied in original box with manuals etc. Canon charger, 4 x batteries (Canon & Hahnel), 4 x Sandisk Extreme 16GB CF cards, intervalometer, Manfrotto QR plate, screen protector, body cap, strap etc. Only really used for video production so minimal shutter activations. Selling due to upgrade to C100. Was originally UK supplied with 24-105 lens but is sold without lens. USED. I’m not familiar with Cone lenses so can’t really answer that question. The HoFo is designed for video and DSLR/Stills lenses (in terms of torque and rotation).